MFI goes beyond technical issues to tackle all aspects of a project." → on technical issues: MFI carries out a Design Study which lays out all technical specifications for the project based on the customer's needs and on-site surveys. Here lies MFI's core and unrivalled skill. Making sure that new systems integrate with each other and with existing equipment is crucial for the success of a meteorological project. MFI will make sure that the necessary IT infrastructure is available to host the new systems, that they take into consideration historical data and that all data flows run smoothly all along the meteorological process. MFI puts a strong emphasis on taking its customers to a higher level of skill and expertise. We offer extensive training programs for all our systems but also on other meteorological-related topics (forecasting, climatology, numerical weather prediction, observation network management, etc. ), or more transversal skills (change management, crisis communication, marketing, etc.). 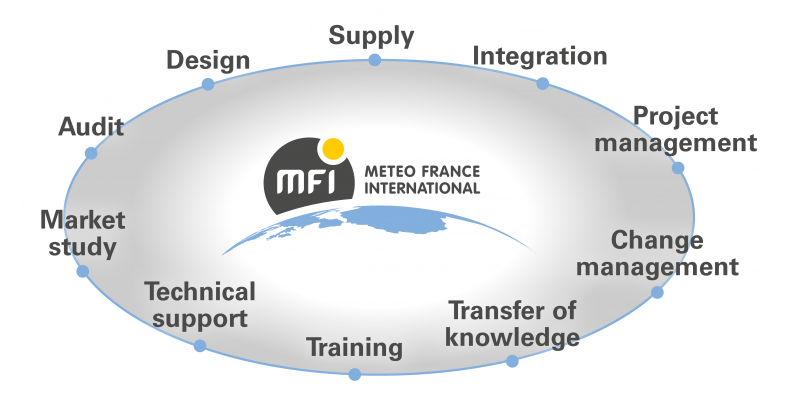 MFI works in close relationship with Météo-France. Our customers can thereby benefit from the expertise of one of the most advanced National Meteorological Services in the world. Specific professional skills, work methods, organization, etc... Météo-France's experts are able to intervene on a wide range of topics and share their operational knowledge of how to run a national weather service on a daily basis.